A little break in Whitby. A view across the harbour on our first little explore. 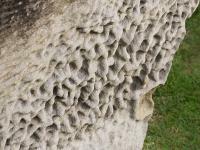 A rather eroded gravestone. Arran found the texture fascinating. We had a lovely day out on the North Yorkshire Moors Railway. First stop Grosmont, to look at the engine shed. A second train then took us on to Pickering. Arran slept on the journey. The scenery was beautiful - it's a very lush green at this time of year. The chapel at Pickering Castle. Our steed leaving Whitby station to head back to the engine sheds. We let Arran stay up and have dinner with us - you can see how keen he is on fish! The headland at the East side of the harbour. Arran was up at 6am so he and I went exploring. Arran was introduced to the kids rides at the amusement arcade. He appears unsure. West Cliff, where the fancy folks stay. The older houses on the east side are a much more interesting jumble! 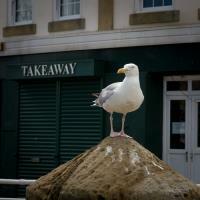 Plenty of takeaways, plenty of seagulls. Cause and effect? Arran is a bit unsure about ice cream too. Whitby Town Centre behind some fishing boats. A new fishing vessel under construction - one of two that will be registered in Lerwick from the looks of the markings. Rough seas at the harbour mouth - the reason we didn't get out on a boat for a pleasure cruise. Whitby beach looks pretty windswept too. Not sure what such a Scottish looking thistle was doing in Whitby, but it made us feel at home. Arran was introduced to the teacup ride at a fair in Scarborough. ..even when his mummy picked him up out of the bigger waves! A lovely day for the beach. Arran tries eating sand for the first time - a mistake he will only make once judging by his expression.